Choosing an Opticron BGA monocular guarantees you one of the best field monoculars available on the market today. 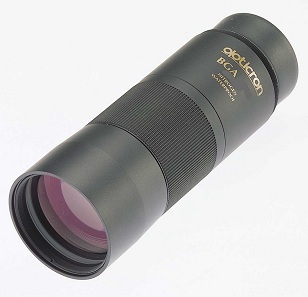 The combination of a large objective lens, high quality Morita roof prism plus a long eyerelief eyepiece means that unlike smaller monoculars, a BGA monocular delivers a viewing experience akin to a pair of average size roof prism binoculars in a pocket size instrument measuring only 43mm x 136mm. DBA Oasis S-Coat monoculars are supplied complete in a soft case with strap and caps and 30 year guarantee.